The Aussiedoodle is a 'designer breed' resulting from a cross between the Australian Shepherd and the Poodle in order to produce a puppy that holds desired traits from both breeds. The idea of crossing with the Poodle is because of their Non-Shedding coat and has gained much popularity, particularly with those who suffer from pet related allergies. Like other 'designer breeds' AussieDoodles has seen a recent surge in popularity. The Aussiedoodle can vary in sizes depending upon the size of the poodle breed used in the mix. However, they generally range from 10-25 inches shoulder height and can weigh between 15-65 pounds. Due to the Poodle influence, the Aussiedoodle may have a wide variety of coats. The AussieDoodle coat length is generally moderate, can be straight or be slighty wavy. Though it may appears shaggy it has a soft, silky texture. The Aussiedoodle is a highly intelligent and friendly dog. They are very family orientated and love spending time with their “People”. Aussiedoodles excel in agility and are often used as service or therapy dogs. They are a well rounded breed who love to play but can be just as content to lay at your feet. 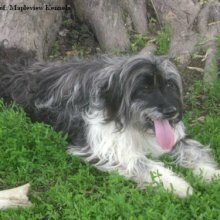 The Aussiedoodle is a highly intelligent and friendly dog. They are very family orientated and love spending time with their “People”. Aussiedoodles excel in agility and are often used as service or therapy dogs. They are a well rounded breed who love to play but can be just as content to lay at your feet. The Aussiedoodles are outstanding family pets who are extremely patient with even small children. They are sweet and outgoing animals who are accepting of other family pets. It is important to properly socialize your Aussiedoodle at a young age. You can find Aussiedoodle puppies priced from $200 USD to $4000 USD with one of our credible breeders. Browse through our breeder's listings and find your perfect puppy at the perfect price. The Aussiedoodles are outstanding family pets who are extremely patient with even small children. They are sweet and outgoing animals who are accepting of other family pets. It is important to properly socialize your Aussiedoodle at a young age. Depending on the coat type, The AussieDoodle requires occasional brushing or professional clipping. AussieDoodles with a loose wave require monthly brushing more often for curly coats. The AussieDoodle is an extremely intelligent breed of dog and is eager to learn. The AussieDoodle will not respond to harsh words, yelling or heavy handed methods. Training must be done with rewards, firmness, patience and consistency. They seem to thrive in an environment where they are challenged. AussieDoodles require exercise and mental stimulation to prevent boredom. They will do well in an apartment provided that their needs are sufficiently met. AussieDoodles can live happily on a farm or a big city. Most enjoy swimming. The Aussiedoodle with be most happy with daily walks and playtime. Aussiedoodle Puppies for Sale - Shipped Worldwide! Finding the right Aussiedoodle puppy can be dog gone hard work. PuppyFind® provides a convenient and efficient means of selecting and purchasing the perfect Aussiedoodle puppy (or Aussiedoodle puppies) from the comfort of your home, 24 hours a day, 7 days a week. Take advantage of our PuppySearch or leisurely browse our directory of hundreds of dog breeds, Aussiedoodle dog breeders, Aussiedoodle dogs for adoption, and Aussiedoodle puppy for sale listings with photos and detailed descriptions. Some Aussiedoodle puppies for sale may be shipped Worldwide and include crate and veterinarian checkup. Many Aussiedoodle dog breeders with puppies for sale also offer a health guarantee. With thousands of Aussiedoodle puppies for sale and hundreds of Aussiedoodle dog breeders, you're sure to find the perfect Aussiedoodle puppy.